Website copyright © 2019 UK College of Holistic Training. All rights reserved. See About page for specific acknowledgements. Total recommended period of study: 2 - 4 months or less. Continuous enrolment. No time limit. Cost: £235.00 (235 Pounds Sterling - for currency conversion see www.xe.com ) Extra costs & shipping may apply for some non-EU countries - see apply page for details. A FREE textbook of over 600 pages will be included for students from the UK. Students outside the UK will need to buy the book separately, normally from an Internet bookstore. Method of study: Distance Learning (Textbook study). Written assignments based on textbooks and exercises. Assignment questions are issued by email and students return their written work by email. Grades and feedback are issued by email. This diploma course provides a solid grounding in the theory of energetic healing that underlies various complementary medical approaches and subtle-energy therapies. The course may be used as a professional development course for those who practice complementary medicine and who would like to know more about its underlying theory and relationship to other complementary fields. The course may also be taken by those contemplating training in complementary therapies, especially "energy therapies" to deepen their understanding. No particular qualifications are required for entry, but a strong interest in healing and/or complementary therapies is expected. This course can be taken as a preparation for a practitioner course or as a supplement to one. 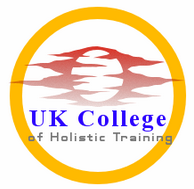 Successful graduates will receive the Diploma in Energy Healing Science awarded by UK College of Holistic Training which is a private UK qualification. Course graduates may use the postnominal designation Dip. E.H.Sc. Please note that this is a theory course only and it does not lead to a qualification to practise any form of complementary medicine. However a mention of the qualification could enhance your professional profile. Please see our FAQs page for general information. We reserve the right to change the syllabus and other details of any course at any time. Gerber, Richard. Vibrational Medicine: The #1 Handbook of Subtle-Energy Therapies. Third edition. Rochester, Vermont, Bear and Company, 2001. Non-UK students: ensure the book you order has one of the above ISBNs, so that you do not confuse it with another title by the same author.